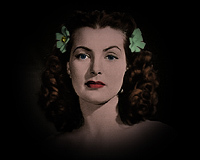 Patricia Roc topped the polls among cinema goers of the 1940's as one of the most popular English actresses, surpassed only by Margaret Lockwood. Yet today hardly anybody remembers her or anything about her. Despite having been so famous and important, modern accounts largely speaking ignore her. There are no biographies and there is very little interest by publishers to fund or publish any as they believe nobody would buy them. It seems incredibly sad that someone who was so popular and gave so much pleasure to so many people could be so completely forgotten only in the space of a few decades. For a long time I considered writing a book about her but decided that since finding a publisher would be next to impossible and finding time would be even harder, this would be the next best thing. I first experienced Pat while viewing a film called "A Window in London" (US title: "A Lady in Distress") back in 1987 or so. She did not have a major part in this film being on screen only for at most a few minutes alongside the likes of Michael Redgrave, Sally Gray and Paul Lukas. But something about her performance really got to me and I hastily dug out the reference books to find out what else she'd done. I was delighted to find a long history of films (mainly made in England) throughout the late 1930's leading through to the late 1950's and I made a point to try and see as many as I could. As time went by and I got to see many of them (none of which have disappointed!) I found out just how loved and important she'd been, particularly during the post second world war era of British Film. It amazed me how she'd been so totally forgotten by most film historians despite her contemporaries, Margaret Lockwood and Phyllis Calvert, always getting honourable mentions! I hope if you knew of Pat before reading this that you enjoy these pages as a fitting tribute to a talented actress. If you have not heard of her before then I hope you will find the pages interesting and informative and will look out for her films next time they are shown. If you have any information about Pat or ephemera or stories about meeting her (if you are of that age!) then I would be very pleased to hear from you. Unlike a book web pages can forever grow and never be a finished product. I would love to be able to add new information to this collection. You can email me here.